Brenden Swanson’s 1968 Chevelle 300 Deluxe 4 Door Sedan “Lucille” – WHAT YOU SEE IS WHAT YOU GET! What you see in these photos is a 1968 Chevelle exactly as it rolled off of the assembly line in the 4th week of May in 1968. 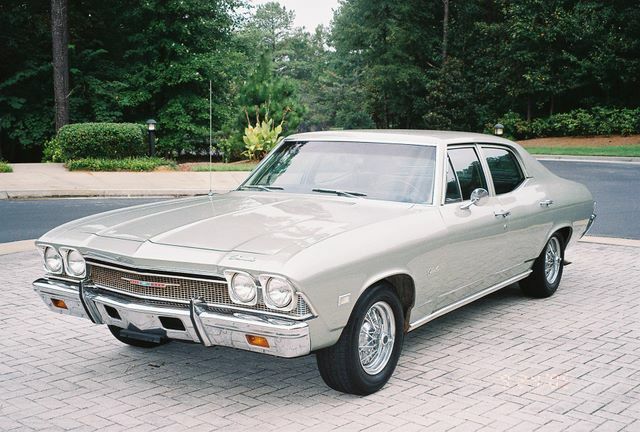 The Chevelle’s story may have started 40 years ago, but the story of Lucille began much more recently. It was Brendan’s junior year of high school and Brendan was teaching martial arts to earn some extra income. Every night on the way to and from work, he would pas a small town used car dealership. He never paid much attention to it until one fateful night when he spied a 1968 Mustang sitting on the lot. The dealership was closed, but Brendan brought his mother back to check it out anyway. At this point, he had high hopes that “this was the one”. Upon arriving back home, Brendan excitedly phoned his grandfather and told him about his find. After the phone conversation, it was agreed that his grandfather would make the drive from Alabama to Georgia to go see the car in person the following weekend. The following Saturday couldn’t come fast enough and they headed down to the dealership to make a deal. As they rolled up, the Mustang was nowhere to be seen. After questioning the salesman, Brendan was disappointed to learn that the Stang’ had just been sold to a girl in his own high school before Brendan had the chance to make an offer. Just when he thought that all hope had been lost, he noticed something. In place of the Ford sat a 4 door 1968 Chevelle. Something just clicked and Brendan was in love. He just had to get his hands on the wheel! His grandfather agreed that a test drive was in order. They drove the Chevelle all the way back to Brendan’s house after noticing a slight misfire in the engine. Luckily his neighbor had previously been employed as a mechanic, so he knew just what tests to perform to make sure there was nothing wrong with the engine. The problem turned out to simply be a bad distributor wire, so they replaced it and the car ran like a dream. SOLD! That night a down payment was made. With a little help from his grandfather, Brendan was now the proud new owner of the time capsule that you see in these photos. The car was officially named Lucille because “she just looks like one” to Brendan. Whoever the original owner was must have babied this 300 Deluxe for the first 45,000 miles of its life because when Brendan came across it, it still wore its original Seafrost Green Metallic paint and retained its original 250 cubic-inch 155 horsepower 6 cylinder motor and Powerglide transmission. In fact, the only thing on this car that Brandon has replaced is the original plastic flooring in favor of some carpet. Since owning the car, Brendan has won several awards and always gets looks. Brendan has turned down several offers for much more than he originally paid for Lucille. Brendan definitely got just what he saw: A time capsule of a Chevelle that runs just as good as it looks!